The Jays headed into Sunday afternoon’s game looking to sweep the Tigers out of the Rogers Centre before welcoming their new guests, the Cleveland Indians on Monday. Well, they got things started right away, wasting little time. Josh Donaldson would take the first ball deep by launching a rocket over the left field wall on a 3-1 count. Shortly after, Edwin Encarnacion would take his own over the right field wall. This would not only be his 30th home run of the season, but it would be his 25th straight game with a hit. With Encarnacion launching yet another bomb in so few games, he would do so in historic fashion setting another record. Eddie’s run in would set a franchise record for most RBI’s in a single month at 35. He has the opportunity to add a few more on when the Jays wrap up August, Monday night when they face the Indians. Things would then continue however into the second at Kevin Pillar would go deep, followed by Russell Martin in the fourth. It was truly a spectacular scene as the first six runs for the Jays came off home runs by four different players. The Tigers would add a pair later in the game during the sixth and seventh innings, but that’s all they would get. The home team would score three more runs in the eighth to finish the Tigers off with a 9-2 win. Mark Buehrle would get his fourteenth win of the season going six innings giving up only 2 runs, 1 earned, walking 2, and striking out 2. It was truly remarkable to see a weekend full of runs, as the Jays would outrun the Tigers 29-6. The defense was also a key part in the victories as the team gelled so smoothly, it was a sense of a feeling, similar to what some would say playoff baseball may feel like. 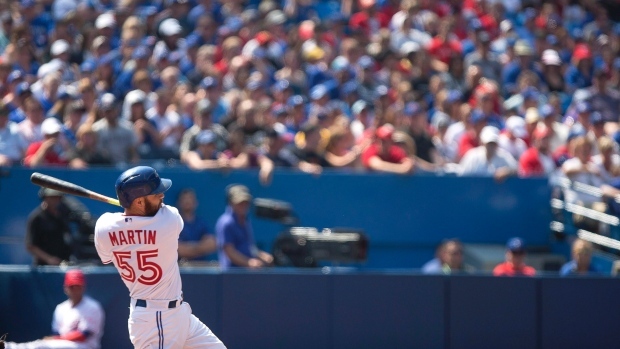 Russell Martin spoke post-game on this team on their recent success. “If this isn’t the feel of a championship team, I don’t know what is. I feel like we’re great offensively, we’re great on defense. We’re pitching great and our bullpen has depth”. Buehrle would also add that if the team doesn’t score eight runs, they feel like they’ve had a bad game. Considering their recent success and the final scores, that hasn’t been a feeling in the clubhouse as of late. The Jays will now turn their attention to the Cleveland Indians who arrive in town Monday night for a three game series. The Indians are coming off a three game sweep of their own over the LA Angels. The opening series starters will see David Price (13-4) take the mound for the Blue Jays as he will be countered by Danny Salazar (11-7). There will definitely be some stat watching as Edwin will be going for his 26th straight game with a hit as well as Ryan Goins will be going for his tenth straight game with a hit. First pitch at 7:07PM est.